Easter service on April 4th, 2010: "Mary Magdalen and Jesus ascending"
Similar to Eliseus seeing his teacher Elias when being taken up to heaven, Mary Magdalen sees her teacher Jesus on his way to the Father in heaven. Does Jesus originally give a double portion of his spirit to her, like Elias did to Eliseus? Does Jesus intend to appoint her to be his successor leading and teaching the congregation? Our issue today is: “Mary Magdalene comes announcing”. We ask ourselves, why people wanted to listen that little to the first female annunciator of the Easter message, and try to listen to her attentively today. 4. Three women go early in the morning; Halleluja, Halleluja, they come to anoint the Lord. Halleluja, Halleluja. 5. They look for the Lord Jesus Christ, Halleluja, Halleluja, who died on the cross. Halleluja, Halleluja. 6. Who rolls away the heavy stone, Halleluja, Halleluja, so that we get into the tomb? Halleluja, Halleluja. 7. The stone is away! The tomb is empty! Halleluja, Halleluja. Who helps us? Where is our Lord? Halleluja, Halleluja. 8. Don’t be frightened! Why are you weeping? Halleluja, Halleluja. He whom you are seeking is not here. Halleluja, Halleluja. 9. Dear angel, tell us, Halleluja, Halleluja, where did you put him? Halleluja, Halleluja. 10. He is risen from the tomb, Halleluja, Halleluja, today on the holy Easter day. Halleluja, Halleluja. 11. Show us the Lord Jesus Christ, Halleluja, Halleluja, who is risen from death! Halleluja, Halleluja. 12. So come and see the place, Halleluja, Halleluja, where your Lord has lain. Halleluja, Halleluja. 13. We see indeed, the tomb is empty. Halleluja, Halleluja. But where is our Lord? Halleluja, Halleluja. 14. You shall go to Galilee; Halleluja, Halleluja, there you will see the Savior. Halleluja, Halleluja. 15. Dear angel, many thanks. Halleluja, Halleluja. Comforted, we go away. Halleluja, Halleluja. 16. Now all are singing with joy: Halleluja, Halleluja. The Lord is risen today. Halleluja, Halleluja. 17. So we all are happy. Halleluja, Halleluja, and Christ will be our comforter. Halleluja, Halleluja. Why seek you the living with the dead? We are following the women leaving the tomb and announcing the angels’ message, facing the eleven disciples and the other men: Mary Magdalen and Joanna or Salome and the other women disciples. And what did the male apostles (Luke 24:11)? These words seemed to them as idle tales; and they did not believe them. Two days after the death of Jesus on the cross, in the late afternoon. Sadly, we are going to Emmaus, accompanying Cleopas and another disciple. A stranger comes across who tries to encourage us, but we are inconsolable. When we tell him about the women who frightened us with their gossip, „empty tomb, angel, Jesus lives”, he becomes angry: How stupid can you get, how hard of understanding! Didn’t you learn anything from the Prophets (Luke 24:26)? 2. Rise from the tomb of sins and seek a new life, carry out the course of your faith and let your heart be raised to heaven where your Jesus is, and seek what is above as a Christian who, spiritually, is risen. 3. Forget now what lies behind, and strive for that what is above, so your heart be raised all times to Jesus. Tread on the vicious world and strive to heaven’s tent, where you find Jesus. 5. Go with Mary Magdalene and Salome to the tomb, who early go there out of love with their anoinment offering, so you will see that Jesus Christ is risen from the death today and not to be found in the tomb. ↑ God give us a heart for his Word and words for our heart. Amen. Did you notice something in the reading from scripture? Paul the apostle undergirds his own faith in the resurrection of Jesus Christ by referring to many witnesses. First of all, Peter – whom he calls by his Aramaic name Kephas – would have seen him, then the Twelve, later 500 men at once and James and all apostles. At last he would have appeared to Paul himself. But Paul doesn’t mention not a single woman! Didn’t he know – what is written in the gospels later on – that the first witnesses of the resurrection were female? Or did he omit the women deliberately? Can it be that he didn’t want to refer to the witness of women, because their witness wasn’t counted as valid in ancient times? Or didn’t he want to hand over any argument to the women in his parishes on which they could have based the claim that they as well could announce the Word and lead the parish? The Evangelists Mark, Matthew, Luke, John do mention the women as annunciators of the Easter message, with Mary Magdalene leading the way, but not without trouble, either: Mark imputes them that they – from sheer fear – don’t even pass on the angel’s message. In an appendix to the Gospel of Mark, Mary Magdalene is identified with another woman who had been obsessed by seven demons, and when she announces the message, the men don’t believe her. Luke tells that the male disciples regard their report as gossip and nonsense. Matthew doesn’t relate explicitly how the women pass on their message and how the disciples react to it. Only in the Gospel of John, a woman raises her voice towards the male disciples, comes and announces them that she has seen the Lord. Let us now hear what Mary Magdalene – as the first of all disciples – experiences and announces on the Easter morning according to the Gospel of John, chapter 20. Mrs. Schau will read the Bible verses, and I interpret them. 11 Mary stood at the sepulchre without, weeping. Mary is depicted in her mourning. She doesn’t go into the tomb although it is open, she is weeping for Jesus to whom she was very close as a disciple and personally. In this narrative of John she is alone, no other woman is with her. 12 And she saw two angels in white, sitting, one at the head, and one at the feet, where the body of Jesus had been laid. 13 They say to her: Woman, why weepest thou? She saith to them: Because they have taken away my Lord; and I know not where they have laid him. Mary looks for the dead body of her Lord whom she had followed until his death, to whom she had listened, whom she didn’t abandon as the male disciples had done. It attracts my attention that the Gospel of John doesn’t mention any ointments to do what women normally did at that tim to pay their last respect to a decedent. Mary Magdalen can only think of one thing: He is not there where he should be. Do his enemies want to disturb even his last peace? Do the public authorities want to prevent the tomb of Jesus being used to stir up a riot? An Albanian Christian living in our parish told me that one of his relatives had been murdered by the Communist regime, and a burial for him was denied so that his grave should not be a cult site for insurgents. 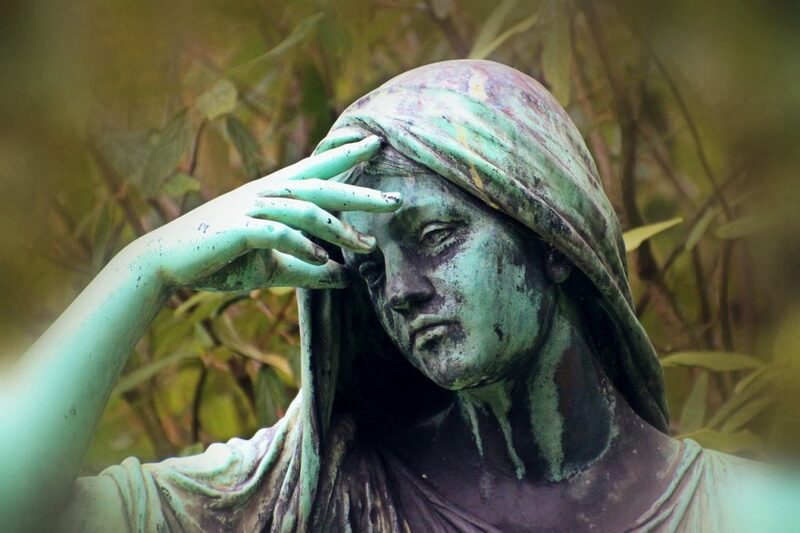 Mary Magdalen desperately seeks the dead body of Jesus, like many a person today who desperately looks for the place of burial of a dear friend or relative who was interred anonymously. For her mourning, she needs something to touch, like many a mourner today wants to have a last view or touch of the decedent to say farewell. 14 When she had thus said, she turned herself back, and saw Jesus standing; and she knew not that it was Jesus. During church history some exegetes of this story blamed Mary heavily for not recognizing Jesus at once. But unlike to the Emmaus disciples, Jesus will not address any reproaches to her. That she doesn’t still recognize him is an indication for the truth that resurrection isn’t a mere reanimation of a dead body looking the same as before. Mary has to recognize him in a new way, she has to reach an insight far beyond her former perceptions. 15 Jesus saith to her: Woman, why weepest thou? whom seekest thou? Jesus puts the same question to Mary as the angels, and he adds a second question: “Whom are you looking for?” Her weeping can come to an end, if she recognizes him, who stands in front of her, whom she is looking for. But as yet her eyes are not open enough to perceive him in the totally new way of being alive. She, thinking it was the gardener, saith to him: Sir, if thou hast taken him hence, tell me where thou hast laid him, and I will take him away. Mary answers to none of Jesus’ questions, she rather clings firmly to the only hope that seems to be remained in her desperate mourning: she wants to fetch back the dead body of Jesus from where the gardener has brought it. 16 Jesus saith to her: Mary. She turning, saith to him: Rabboni (which is to say, Master). Mary responds to Jesus by addressing him not by his name, but – in Hebrew – as “Rabboni”, my esteemed Rabbi! He is her Torah teacher and she is his disciple, though it was unusual for a rabbi to teach female disciples (further on with the Gospel of John, chapter 20). 17 Jesus saith to her: Do not touch me, for I am not yet ascended to my Father. They acknowledged him as the successor of the prophet and as their new teacher. Similar to Eliseus seeing his teacher Elias when being taken up to heaven, here in the New Testament Mary Magdalen sees her teacher Jesus on his way to the Father in heaven. Does Jesus originally give a double portion of his spirit to her, like Eliseus received two parts of Elias’ spirit? Does Jesus in fact intend to appoint her to be his successor leading and teaching the congregation or does he at least delegate to her a shared responsibility with Peter and the beloved disciple? But go to my brethren, and say to them: I ascend to my Father and to your Father, to my God and your God. 1) Jesus speaks to Mary not about resurrection, but ascension to heaven. Perhaps because resurrection could be misunderstood as a simple return of his body back to the earth. As a human being on this earth, he actually died. But he does not sink in the abyss of a dark Hades, but like Elias is taken up to heaven by God. 2) While going to his Father, Jesus emphasizes that this Father is the Father of his brothers and sisters, too. “I ascend to my Father and to your Father, to my God and your God.” (John 20:17 This message sounds more modest than the confession that Thomas professes towards Jesus after overcoming his doubt: “My Lord, and my God.” (John 20:28) The Gospel of John reflects different opinions about Jesus being the Son of God: In the message of Mary Magdalene he is the Son of Man, the Human One. He leads his life, imbued with God’s spirit, according to the image of God. He is taken up to heaven by God. He paves the way to the Father for everyone. Thomas on the other hand seems to identify Jesus with God, so the church had to develop subtle dogmas to declare that Christians nevertheless don’t believe in multiple Gods. I think, in the church you should be allowed to believe in Jesus Christ in both ways. 3) The mere fact that Jesus gives this mandate to a woman and that Mary Magdalene does see him with her eyes of faith when being taken up to heaven, is a distinct message to the male disciples who have always had trouble with Jesus talking to women like the Samaritan at the well or Jesus being anointed by a woman. Inherently, based on Mary Magdalene’s message, the disciples should have a good reason to acknowledge with joy: “The spirit of Jesus rests on Mary Magdalene”. But will they do (John 20:18)? 18 Mary Magdalen cometh, and telleth the disciples: I have seen the Lord, and these things he said to me. Mary comes to the disciples announcing bravely and gladly what Jesus told her. And that is the end of her appearance. We don’t come to know, whether the disciples answer her at all. What follows, is a sudden change of scene. Jesus appears to all disciples together, at first without, a week later including Thomas, and they all receive the Holy Spirit. Not a word is henceforth told about Mary Magdalene or other women in the Gospel of John. Her announcement is in limbo, seems to deflagrate without effect. Up to now, many a Christian or whole confessions have trouble with thinking that women are capable of preaching and teaching in the church. On this question, our Evangelic Church has learned something new, thanks to God. At the end of my sermon I ask myself: What I preached you – could it reach you as the real Easter message? Or did you think: „What a boring theological lecture! I am not in it at all!” I’ll be happy to get open and also critical feedback from you. And even more happy I will be, if one or two in our midst may be full of joy about the Easter message. Jesus is risen, has gone to his Father and to our Father in heaven, and from there he addresses all of us by name, for instance by means of the words announced by Mary Magdalene. Amen. 1. When, early in the morning, the first sunbeam reaches you, holding its ground by the side of you, when many a corn flows into your glass of joy, you can sense then, you are free! And then a new morning is coming, and the days become bright again, grief and sorrows are put off, the sun quickly gleams them away. In the Lord’s Supper, Christ is with us alive, the Son of the Father in heaven. Due to him we are children of the heavenly Father, too. Due to him we are a congregation of brothers and sisters. Do you want your mind and lives being changed by God’s forgiveness and the hope for the resurrection of the dead? Then say aloud or quiet or without words in your heart: Yes! According to your sincere confession I award you the forgiveness of your sins – in the name of God, the Father and the Son and the Holy Spirit. Amen. Holy, holy, holy is the Lord of hosts; all the earth are filled with his glory. Hosanna in the highest. Blessed is he who comes in the name of the Lord. Hosanna in the highest. Our Father in heaven, hallowed be your name, your kingdom come, your will be done, on earth as in heaven.Give us today our daily bread; and forgive us our debts, as we forgive our debtors; and do not subject us to the final test, but deliver us from the evil one. For yours is the kingdom and the power and the glory forever. Amen. Christ, you lamb of God, you carry the sin of the world, have mercy upon us. Christ, you lamb of God, you carry the sin of the world, have mercy upon us. Christ, you lamb of God, you carry the sin of the world, give us your peace. Amen. Gott invites us. We eat the bread, we drink the juice of the grapes. It is an invitation, not an obligation. If you really want to, come into our circle of the Holy Communion. The peace of the Lord be with you! Taste and see that the Lord is good! Amen. The participants are standing round a table in front of the steps to the altar; at first two baskets with bread are passed along the circle; then the minister gives the juice of grapes in small goblets to every single participant. Jesus Christ says, “I am the resurrection and the life: he that believeth in me, although he be dead, shall live” (John 11:25). Take and pass on what is given to you – the living body of God’s Love. Jesus Christ says, “Blessed are the clean of heart: for they shall see God” (Matthew 5.8). Take the goblet of reconciliation, of a new beginning, of reconciliation between God and Humans. Jesus Christ says, „I am the First and the Last, and alive, and was dead, and behold I am living for ever and ever, and have the keys of death and of hell” (Revelation 1:17-18) Go forth in peace! God, Father of Jesus Christ and our Father, let us recognize you in the faith on your Word that gives us guidance and new insight, comforting and liberating us. Let us announce you on Sundays and in everyday life, together with all people who have understood something about you. In trusting on your resurrection let us rise from prejudices and indifference, from habits and obsessive thoughts. Those who have suffered evil even by people who call themselves Christians let experience justice. Help us to make accountable offenders and side with their victims. Let us get ahead in faith step by step throughout our lives until we are made perfect in your kingdom when the time has come. Let the dynamic faith in the resurrection of Jesus Christ transform us already here on earth. Amen. Christ is risen from all tortures; so we shall be joyful, Christ wants to be our consolation. Kyrieleis. If he were not risen, the world would have ceased to be; since he is risen, we are praising the Father of Jesus Christ. Kyrieleis. Halleluja, Halleluja, Halleluja! So we shall be joyful, Christ wants to be our consolation. Kyrieleis.